With the Business Meeting behind us, our official commitments to Westercon were done and we were more or less free to spend the rest of the day without a cloud of must-get-this-done over us. We checked in with Dave Clark at the Cargo Cult Books table to confirm that we can transport a box or two of his overstock back with us tomorrow when we head homeward, as long as he knows he won't get it back for a few weeks, as it will be a while before I'm back in the Bay Area. Around 6 PM, I went to a rather impromptu and informal gathering of staff and committee of Sasquan, which was actually the first Sasquan meeting I've attended and probably the last until a projected all-hands meeting in Spokane next spring. 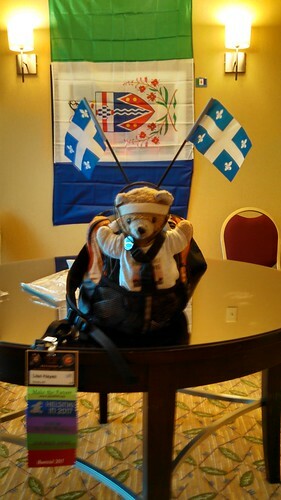 Although Kuma Bear is partial to Helsinki because it has a Bear, he also likes Montréal because they are so nice to him, although he thinks this headgear they asked him to wear was sillies. As a director of Montréal in 2017's parent non-profit corporation, I felt obliged to help set up the bid's party, and Lisa and Scott Sanford (and Kuma) came along to help as well. 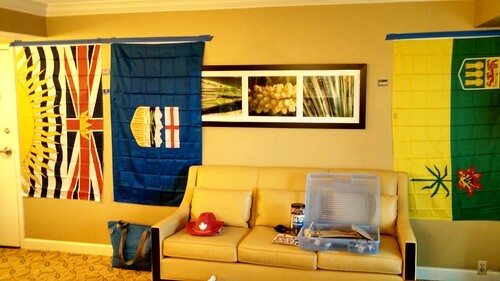 We hung provincial flags along the walls. I had the idea of posting the tags identifying each province next to the flags. After helping with the Montréal set-up, Lisa and I went with Scott across the street to the Italian restaurant on which we'd had our eye earlier. Unlike the other place in the mall, they didn't insist that all of their meals had to be heavily spicy, so Lisa was able to get something she liked, while I was still able to get a sufficiently spicy pasta meal to suit me. By the time we got back to the hotel, parties had opened. 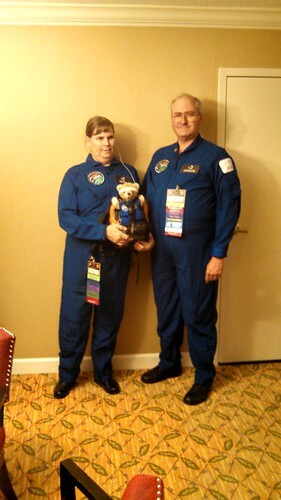 At Lisa's suggestion, we changed into our Chicon 7 jumpsuits, and I couldn't help but go to the first official San José in 2018 Worldcon Bid party and say to anyone who would listen, "Did you say this was a launch party?" One person said, "No, it's a kickoff party. Where's your football uniform?" 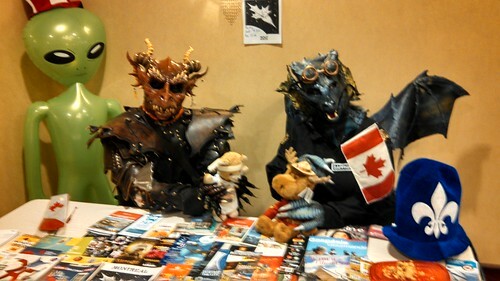 We spent the rest of the evening mostly bouncing back and forth between the SJ2018 and Montréal 2017 bid parties, with a side-trip to Westercon 69's victory party in the Con Suite. As Midnight approached, we had to bail, because on Sunday we have a drive to Ely ahead of us and we have to be able to get checked out and on the road again for the Road Less Traveled.